Easter Sunday is this week, which just seems crazy to me...I swear it was Christmas only a few days ago? I love Easter because it feels like the arrival of Spring with the daffodils in full bloom and the pastel colours everywhere, I love that it means spending time with family and of course I adore the food. To me, Easter food should always be indulgent - it should satisfy your taste buds completely, taste heavenly delicious and of course on Easter Day chocolate should always be consumed, it's mandatory. 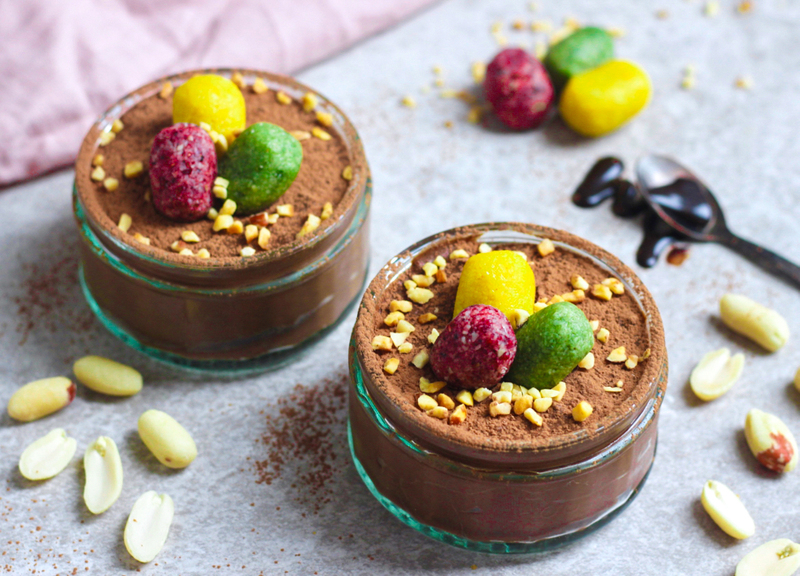 This new recipe for Mini Egg Peanut Butter Chocolate Mousse pots ticks all those boxes, all whilst actually being a slighter healthier version with no refined sugar, no dairy and no gluten either. All the ingredients in these creamy mousses are plant based but the taste isn't compromised because of these, they're sweet, rich and unbelievably more-ish. The mini eggs on top, made from ground almonds and dyed with natural food colourants, add a bit of Easter decor and taste yummy too! The mousse is made from all ingredients you can find in your local supermarket such as dark chocolate, almond milk, dates and peanut butter (top tip - use crunch for an extra something special). 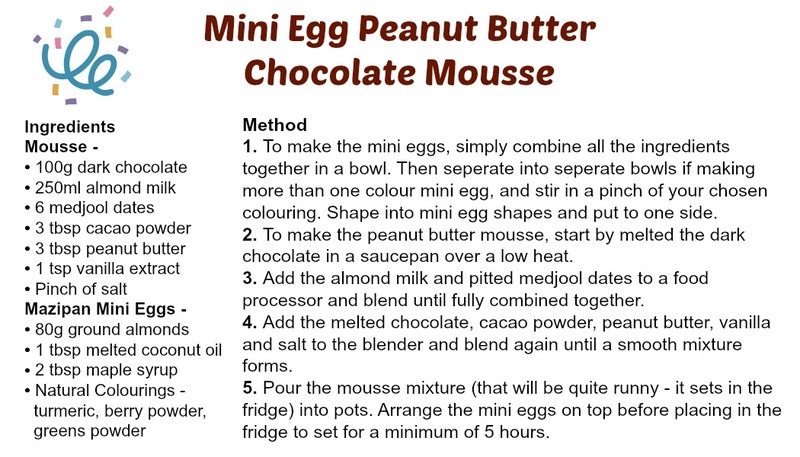 You simply blend everything together, add to pots and set in the fridge for a few hours to create the mousse texture! Then you can top with the cute mini eggs, which you can make any colour you desire. I made a purple, a bright orange and a green - I used berry powder, turmeric powder and greens powder to dye the marzipan eggs but you could also use beetroot, spirulina, coffee, saffron, etc. 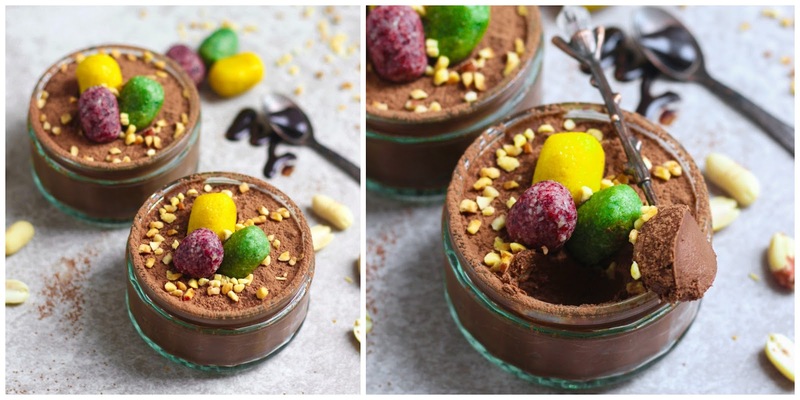 These mousse pots are a great recipe to make with kids or to serve up on Easter Day! They'll keep in the fridge for 3 days too, so don't worry if there's any left over....although I highly doubt there will be.